This is from Columbus OH. I think its a super cam. Awful lot of chemtrail spraying going on. 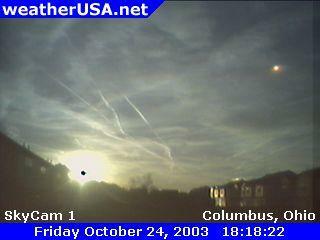 Note the Fire Dragon moving independently from the Sun as it sets. It can be seen at the very edge of the photo at 17:36, not a lens flare as it retains its relative postion throughout, vs a vs the condo on lower right. This is also on the Virgo side of the Ecliptic.